The Green Man01621 776226work InnThere's a relaxed atmosphere in the pub and its easy to see why its remained so popular with people returning again and again to this pretty part of Essex. The Green Man is steeped in history and was once famous as a Smugglers Inn. The exposed oak beams and whitewashed ceilings are testimony to the way the pub has been preserved. A large Inglenook fireplace beckons you to warm yourself on Winter nights and enjoy the atmosphere that lends itself perfectly to hearty conversation over a pint or two. During the warmer months you can take advantage of the large Beer Garden or take a stroll and take in the views of the Blackwater Estaury only yards from the pub. Visitors to the Green Man, including many Ramblers, Twitchers and Yachtsmen travel here to enjoy some splendid scenery in this largely unspoilt part of the Essex coastline. Take advantage of an excellent selection of home cooked meals prepared by Chef Michael Debono and are available either in the restaurant or in the bar. The menu is supported by an equally good wine list. On Sundays you can enjoy a Traditional Roast and there's always a Children's Menu available throughout the week. The pub has a good sized Family Room for customers with small children. For gourmets, there's a Food Theme Night every other Thursday. On weekends you can take advantage of freshly caught fish that feature on the Specials Board. The Green Man caters for small parties of up to 40 persons seated and for 40 persons for buffet style occasions. The pub also offers overnight accommodation and has facilities for disabled customers with good access and toilets. There's a large car park that can accommodate Coaches, (prior notice is preferred). There's a relaxed atmosphere in the pub and its easy to see why its remained so popular with people returning again and again to this pretty part of Essex. 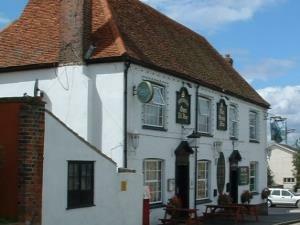 This lovely old pub has something to offer everyone and Proprietors Phil & Lyn Buttling and their team look forward to welcoming you the next time you visit Bradwell on Sea.